My name is Tai and I am trained as a lawyer but chose to stay home and raise our family. My husband, Tom, works as a Parole Officer. 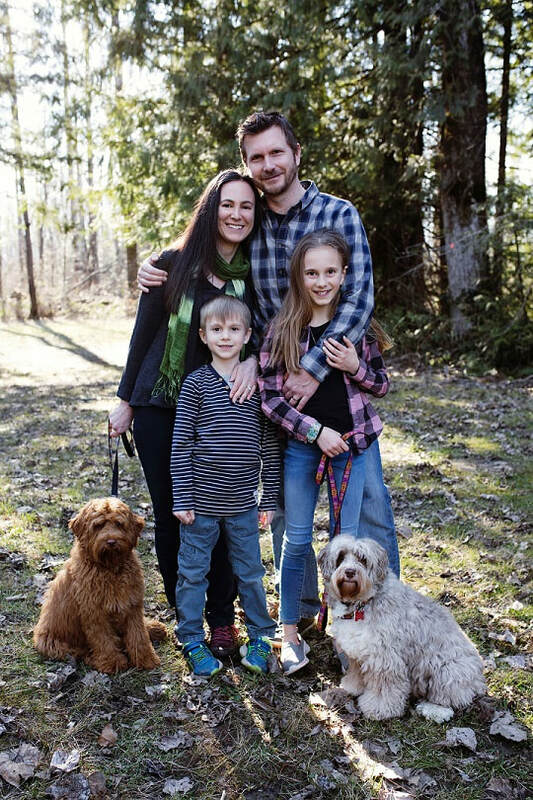 We have two incredible children, 10 year old Leah and 6 year old Evan. We are an animal loving family. We have two Australian Labradoodles, a cat, and fish living with us. The rest of our wonderful breeding dogs live in their forever guardian homes. I fell in love with Australian Labradoodles and began breeding them in 2003. We had an incredible journey breeding these amazing dogs for quite a few years until we started having our human babies. At that time I stopped breeding Labradoodle puppies and focused solely on our children. Now I am back to my love of breeding Australian Labradoodles and loving every minute of it! We live in a lovely residential neighborhood with lots of children and animals. We walk our dogs daily and often walk up to our local park, Sardis Park, only a couple blocks away. We chose to name our breeding program Sardis Park because a huge part of why our puppies are so special is because of their socializing. Our puppies are used to children, other animals, and all the normal family household activities and noises. Our adult dogs are regular family pets just as your new family member will be. They don't live in kennels or outdoor pens. They live indoors with us, sleep in our bedroom, and play anywhere in our home they want. Happy, healthy adult dogs produce happy, healthy puppies! Not only do our Labradoodles have fantastic temperaments, they also are extremely healthy. We do thorough and extensive health testing on all our breeding dogs before they are included in our breeding program. Our Australian Labradoodle puppies are the best of the best! Come meet them and you will see! We are located in Chilliwack, British Columbia, Canada. We are about an hour drive from Vancouver, BC. We often make trips into Vancouver and are happy to deliver puppies to their new forever homes. We do also love visitors and you are always welcome to come visit us! We can also ship our puppies to any major airport from the Vancouver airport. For more information about shipping please contact us. 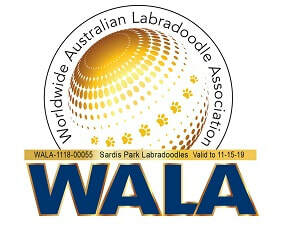 We are proud to be an approved breeder of the Worldwide Australian Labradoodle Assocation and the Australian Labradoodle Club of America.